Nowadays, its easy to make funeral photo memory books. There are a number of websites; Picaboo, Heritage Makers, Snapfish and Creative Memories. In particular, both Picaboo and Heritage Makers have books that make wonderful memorials - whether you want to create a tribute or a family history, or if you simply want to tell the story of your loved one. Both sites have great ideas, with lots of hints and tips to guide you through. Once you've chosen your style these sites guide you through the process of creating your book. You can either do it yourself, or in the case of Picaboo and Snapfish, you can opt to have it create the layout for you. And before you know it, you’ve created a beautiful funeral photo memory book. Once you have your photos uploaded to your computer you're ready to begin making your photo memory book! A couple of companies require you to download software - Pickaboo and Creative Memories, whereas Snapfish and Heritage Makers are web based and don’t require you to download anything. From there you are guided through the steps of uploading your photos, choosing layout, backgrounds, editing photos and adding in your text. In most cases you are able to choose from an incredible variety of backgrounds and themes, fonts and corners. Heritage Makers and Creative Memories require you to become a member or purchase their software to get full access to their library. If you don't join the selection is quite limited. Pickaboo has thousands of themes you can choose from. Their designs, backgrounds, and themes are all free. If you’re feeling overwhelmed with the choices, you can go through and take a look at their samples. Now you can order the hard copies of the funeral photo memory book but be sure to check on not only the shipping times, but the processing times as well. 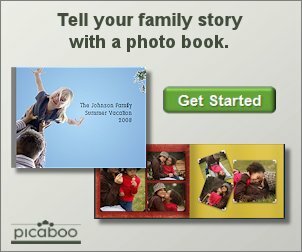 Picaboo has a selection of photo memory books that can be processed in as little as 3 to 4 days – most of the other sites need a minimum of 7 days. They all have a variety of shipping options, including next day service. Another great feature with Picaboo, as well as Snapfish, is that you can email your digital memory books for free to friends and family members to view and order their own copies if they wish to do so. While all of these sites will help you to create a beautiful memory book, my preference is Picaboo. Their site is very user friendly, easy to follow instructions with tips and hints to help the novice bookmaker, and their selection of free backgrounds, themes, book styles, fonts and corners far surpass those of the other sites. Completion time is the quickest. With Heritage Makers, you need to become a member ($24.95/mo) in order to have full access to their catalogue of themes and backgrounds – but that also gives you access to free workshops, along with their catalogue. Creative Memories is similar in the fact that they do have some free options but have software to purchase to give you their full range of backgrounds and themes, I don’t find their site to be very user friendly. Snapfish is free, but has a much more limited selection but their site is also quite user friendly. They are a good option if you’re looking to do a fairly simple and basic book. Creative Memories has implemented many updates over the past months and it would be great to have their offerings revisited. Yes - they do have software for purchase, but they also have free download software which I have found to be fantastic.... very intuitive, user friendly, etc... and most of all the end product is one of the best I have seen!